First, watch this video to learn how to play the melody line (right hand) of Row, Row, Row Your Boat (in the key of C major). Next, in the video below I teach how to play the left hand for "Row, Row, Row Your Boat." We need only two chords: C major and G major. I show how to play them as broken chords, to create a "rocking" accompaniment to this peaceful song. In the third video, I explain how to read the music (the notes) for the melody. 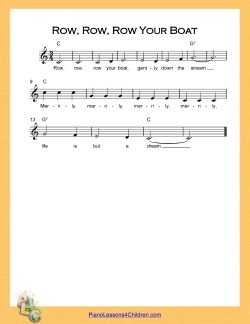 Here is a printable sheet music (PDF file) for the song "Row, Row, Row Your Boat". It has notes, chord symbols, and the lyrics. Use it while studying these lessons.